Today, let me explain you for a better understanding. "A splash coat" is a wet mixture of ordinary cement, water and chemical solution for chemical curing, and then applying a splash coat to make the walls get rough substrates to create more bonding strength. 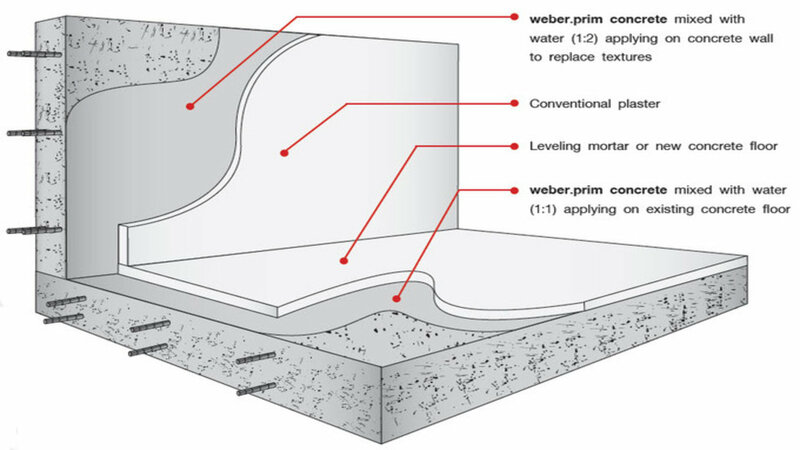 Inconsistent bonding due to splash coating would be easily eliminated with the use of weber.prim concrete roller easily application. Leave too much spaces in between splash coat will reduce plaster's bonding strength. It is a cause of cracked in plaster and peel-off plaster surface. It takes at least 1 day for splash coat hardening before plaster rendering. As the materials used for making splash coat are made from a variety of materials, a constant quality control that cannot be provided well. After learning this fact, let's try to use weber.prim concrete, a bonding improving primer to general plaster which is easy to use, time-saving, just wait for 20 minutes before the application of any render materials.